We emphasize good service and we are committed to constantly improve the quality of our product. We are therefore proud that we were one of the first hostels in the world to be certified as a HI Quality Hostel with good practices and standards. Now we continue this hard work to become an even more sustainable company through Hostelling International, which means that we can eventually adorn ourselves for being one of the few HIQs (S stands for sustainability) hostels in the organization. We have been working closely with ‘Visit Lillehammer’ and HI Norway in 2017 and are now a Green Key overnight company and in 2018 we also will be sertificeted as a HIQs hostel . Mapping of energy use, garbage handling and opportunities to change the routine of the employees and guests. We encourage our guests to get around together and tell this both on the website and physically in our premises. Our employees are in the spring of 2017 in the “Cycling to Work” campaign, and we strive to drive collectively, go or ride a bike where is physically possible. In cooperation with HI Norway and the peace corps, we have volunteers that help us focus on sustainability, suggesting and implementing concrete actions here at Lillehammer Station. We value local production, history and culture. For this reason, mostly of our furniture is locally purchased from the region or from Norway. This way, we help to save energy and carbon emissions from the transport. Nonetheless, we promote local designs, and encourage local economy growth, contributing to generate more income and more jobs for people around. Local is better and more sustainable too! Check on how our decoration and furniture looks nice. 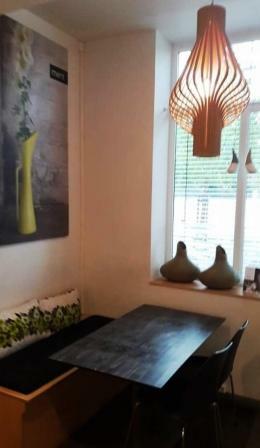 Local art, norwegian furniture and famous norwegian art lamp from local factory in Dokka – county of Oppland. In Stasjonen, we are concerned about serving the best food to you. We use many organic ingredients and most of what we sell is homemade by our chefs in our own kitchen. Our specialties are the Norwegian waffels!, the cakes and the bread from the local bakery. The smell of fresh made waffel shall meet you when you visiting us. For drink, you can have either a healthy smoothie, a local appel cider or a local and delicious beer from Lillehammer brewery or Gausdal 704. Do as the locals – “Lillehamring”. Gather as much information as best local tips. Help look after the landscape by not littering natural areas. Protect the nature. Hostel staff is always prepared to give you the best advices. Swap and share. We have areas where you can leave or swap books, food, clothes and other travel necessities. Reduce, reuse and recycle. Support us in our efforts to recycle – you will find system and information at our place. Ask us if it`s unclear where you can dispose of recyclables. Switch the lights off, turn down the heaters, unplug what you`re not using and join. And leave the car behind! You`ll see a lot more and it`s cheaper! Be social. Hi Lillehammer hostel are a great place to meet people from all around the world – you`ll always get an opportunity to enjoy a meal with other guests in the guest kitchen or other common areas and make valuable friendships. Join our free and green activities. Free bike hire and free guided tours weekly in the summer season are some of the offers. We have also suggest 10 other free tings to do in Lillehammer!